I have posted in the past about ETS and Pearson, two companies that often hire people to work from home scoring tests. Write Score is another such company, but with this one you are scoring essays written by elementary, middle, and high school students. From what I can see, this opportunity is for U.S. residents only. How much does Write Score pay? Although the pay is not listed, a reader recently let me know you are paid 35 cents per essay regardless of the grade of the person who wrote it, whether it's typed or handwritten, or how long it is. So, your hourly rate will fluctuate depending on how quickly you can do the scoring. You are hired as an independent contractor for this company, so they do not take taxes out of your pay. It does not look like you have to have any experience or have a teaching certificate or anything like that. They do however require a 2-year degree (but it doesn't say in what field, so I guess any 2-year degree is acceptable.) Write Score will train you how to do the job so you don't have to go in with prior scoring experience. As far as technical requirements go, you need email access and high-speed internet. I did some research, and it appears that after you apply you will be invited to start the training process if Write Score feels you are a good fit. Starting training does not mean that you are hired however and the training is, from what I've been reading, a pretty grueling process. In order to have a shot at getting a job with Write Score, you have to pass the training, and also not everyone who passes the training will get in because they have limited slots available. Another possible problem here is that you are not compensated for your training. I know for some of you this is a deal breaker because why would you want to spend time training when there's no guarantee you will get the job? I can't find any information about working a set schedule. Instead, you are given deadlines that you have to meet. This might be a little more flexible than a set hourly job. I scoured the WAHM forum for information. Write Score is a good fit for some people, plus they pay in a timely manner. However, other people are not willing to sacrifice time on the training when they know they might not get the job. The work is seasonal so you couldn't depend on it long-term, but it looks as though the pay could be good and the work seems pretty flexible if you can get in. The company typically posts the listing there in the month of July, with hiring ending in August of each year. You can go here to check for openings. Check out these other work at home test scoring jobs for more options! Post originally published July 2012. Updated and re-published July 2017. 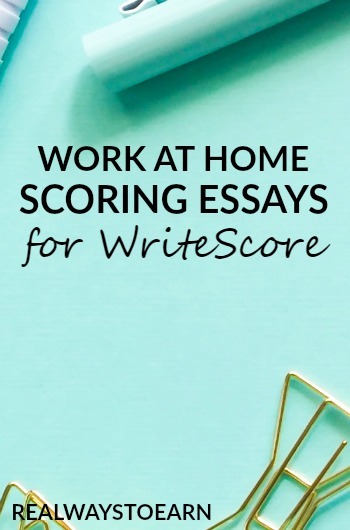 Thanks for telling us about this opportunity to work for Write Score. This is very interesting! Have a great day and week hun! I have been working with WriteScore for three years. This will be my fourth. Once you get past the training its great. There really isn’t a limit on how much work you cab do. It gets pretty slow at the end of the year but during peak season there is plenty of work. Pay is every two weeks like clock work. And the team leaders are easy to work with and talk to. Thank you everyone for all of your helpful comments. I just applied today (7/6/17). Please check on Career Builder if you are interested. I would like to know what their pay schedule is? Is it weekly, bi-weekly, or monthly? I know it’s been some time since this was updated, but I would love a reply. Thanks! Good luck, Kimberly! I’m not sure what the pay schedule is, but if I find out, I will update and let you know. Pay is Direct Deposit every two weeks! How does anyone feel about sending an email of a state-issue id? Is this safe? How do I apply? I clicked the link with Career Builder, but there was no job listed. Does anyone have an email of someone could contact for possible training? Thanks! It’s possible they are done hiring for this season, if the lead is no longer listed. However, ETS and Pearson are two other companies that have nearly year round openings for test scorers if those interest you. Don’t get involved with this company Write Score. I completed ONE of the 15 courses required. To study all the materials you will have to devote 2 hours or more to EACH of the 15 courses with no guarantee that IF, repeat IF, you pass all the many quizzes and tests will you get any paid work. This is a ripoff of workers’ time and effort. Pearson Educational Measurements and Educational Testing Services have ALWAYS paid for training. I’ve worked 16 years for Pearson and I have friends who have worked for ETS; these are 2 legit companies. Write Score is NOT a scam, although it doesn’t pay as well as Pearson and ETS. I worked for them last year and got paid regularly. Having said that, they have changed their organization this year (Fall 2016) and I don’t like what I see so far. Will give them more time to work the bugs out. This year’s training exams were hard. What didn’t you like? I am working for them for my first time. Also, do you know how often they pay out? I was in the July 22nd training and I got hired. For me, everything went smoothly. The training was clear enough that the person who went over my “homework” scoring each time told me i did an overall good job and just pointed out the ones that i did get wrong and why. The more i did the homework that were assigned the more i understood and just simply got the hang of it. I was told i made the team because i kept improving. Right now, we are still working on homework the only difference is, these are paid. I’m guessing once the school year starts we will be loaded with essays lol I’m still not perfect but I’m much better and getting faster at it. If you want to apply and do the unpaid training then give it a try, not everyone has the same experience. I’m happy I got hired and am only getting better at it. I thought I wasn’t that great but i did my best and I made it! I just read that review on glassdoor and am currently in the middle of training. They do have a point though. Making sure the trainees have adequate understanding of the material is a good starting point. Not everything is clear as water. Is it too late to apply? Do you have the link? I can’t find it on their website? Went to CareerBuilder but nothing showing. I noticed the other day that the Career Builder link was expired now, so I guess the hiring window has passed for this season. If you emailed them they would still let you train, however you should be glad you didn’t go through the unpaid training. I saw reviews from a few years ago that the training was clear, but my experience was horrible. I got to the last assignment and we didn’t talk about how to score it in class but the PowerPoint slides were straightforward so I wasn’t too worried about it. Basically, the last assignment had to do with brief essays. In the training materials it states simply that brief essays (for 4th grade and higher it would be less than 3/4 of a page) are scored “0” in each category and only marked with an “X” in “Not Enough”. Before I went through the slides in the Zero Essays Overview, I actually scored them based on the material that was there and I gave most of them a “1” in each category. However, when I went over the training material that states very clearly it should be a “0”, I changed the answers. I got my assignment back the next day and I was told all of my answers were wrong. The person that scored me gave a “1” in each category and completely disregarded the training material. Even though this was extremely frustrating (keep in mind I fit unpaid training around a full-time job, which disrupted my sleep schedule quite a bit), I politely asked them to please explain how the scoring changed so drastically and to please look at the training material to see how I came up with my scores. I didn’t receive a response to this question and was told a few days later that I did not score high enough to pass. Sigh….. so I just wasted a lot of my time and I am now wondering how anyone actually is hired unless they also completely disregard the training material. I could totally understand if I scored incorrectly on subjective material (such as the flow of the paper and whether it makes sense), but being told to score a “0” in each category when there is less than 3/4 of a page is pretty clear cut. I’ll try to just be glad I didn’t get in, but I do want others to know how frustrating the training was for me and to help them avoid the headache. The thing is, I don’t necessarily think my trainer was bad, I think the person that graded my last assignmentwas bad. She completely disregarded the training material and didn’t even explain herself when I showed her that their PowerPoint slide gave a completely different explanation. I hate that you wasted so much time! I wonder if you can contact someone higher up in the company to have your assignment reviewed by someone else? I just got through the homework and found the last assignment easier than the others since it was actually based on reference material. The scores didn’t make much sense when compared to the slides and the classes. I didn’t make the cut but am wondering who else in the class was successful; outside of the veteran scorers that is. I was in the same training I believe, and I made the cut. I agree that it was a little confusing, but I think my education degree background helped quite a bit. I’ve graded a lot of work in the past 2 years. If I only had the training material to go by, I’m not so sure I would of passed. I start training on the 14th as well! I wonder if any of us will be in the same group! Good luck to all – I’m hoping I pass all of the tests after training to secure a position. I’m currently a SAHM so this really fits my lifestyle perfectly right now. I just received an email for training starting July 22, 2014 an am excited to begin. Could anyone comment on how the recent training went? We are still training. We train Monday (7/14)-Monday (7/21) with the weekend off. It has been pretty quick, as the presentation is on powerpoint slides. After we finish on Monday we will receive homework assignments every night of papers that we need to score on our own that we send to a designated Master Scorer. After we do that for a week, we are complete and we wait to hear back (about a week) regarding whether or not we are hired. There are only a certain number of people they are looking to hire, and there are more than that in training. That being said, many people drop out after the initial Q&A seminar because it doesn’t seem like something they can commit to, or something that fits your current lifestyle. This is also part of the reason they do not pay for training. If they did, it would end up being an expensive loss. Thanks so much Jenifer K for your response! Good luck! Hi April. Thanks for all the helpful information. Can you let me know what the piece rate is or is that confidential? I have not scored with Write Score this past year, but while I was there, it was .35 cents an essay. It adds up quickly though, because once you get the hang of it, each essay typically takes you under two minutes to score. Of course some will take longer and some will be super quick (blank, or just a few sentences). Their rates may have changed since I was with them, but for the three seasons I scored, it was all the same. Hi! Sorry everybody…didn’t know there were all these responses! I guess what I meant by practice essays…thinking that was maybe something in the beginning in the application process? Seems there was something that you had to pass before being considered for training, I don’t know…been too long! Anyway…yes, as long as you have received a response, sounds like you passed the application process and are on your way! Congrats! As for webinars, it was my first one also. Basically, you just go to the website they direct you to and log in. You will need to be able to hear the trainer, but you don’t need to use a webcam for anything. You will be able to type in questions for the trainer that they can see and will respond to. Basically, you only have to log in and listen, take notes, etc. It basically is just a class online. As for holidays…yes, they send you essays at all times, but often it seems there are more over the holidays because the schools all test their students before the holidays. You always have the option to decline any work they send and can send an explanation as to why you are declining. I have never done this, but I know some have. You can also send them a message telling them you will not be available to score on certain dates…again, I have never done this, so don’t know how they actually respond to it, but they understand things come up. and Robin, reading 1000 essays a month is a challenge! 🙂 That is why it is better not to have too many other things taking away from your time. They prefer you don’t do this and have an outside job. Thanks for your response. It’s very helpful. I was up for this and something with triple curve. I think I’ll hold off on that for now as this seems a better fit. I received an email for training and responded. I’m excited! Can anyone give insight into the webinars? I’ve never done one before so I’d like to have some idea of how the training is done. I applied yesterday and confirmed that I was still interested after reading the requirements. I never received practice essays to score, however. Instead the return email stated that they will be sending out an email by the end of next week with the training schedule. Does anyone know if the application process changed? I received the response email after applying and it says you have to be available to respond via phone and email immediately or you could be terminated. Do they have set hours they want you to work? When I worked for them I never once spoke to anyone on the phone. Everything was via email. What they mean by immediately is within the day, preferably as soon as possible. You can work any hours you want, so long as you meet your set deadline. Say they give you 500 essays on Monday morning with a deadline of midnight on Wednesday. Regardless of when you see that you have essays, they are still due on Wednesday. Which is why you always need to regularly check your queue for work and essays to see any special notes. I applied this morning and have already received the “are you still interested?” email. Why yes, yes I am. The email mentioned a webcam. My laptop has one, desktop does not. The mike on my laptop is cruddy. Is this something that you actually use? I don’t mind buying the equipment if I make it through training, but would I need it before I finished the training stages? Thanks for all the information you have already provided! Not April, but I worked for Write Score for three seasons. I never needed the webcam, all the webinars were done through chat, aside from the host at write score who used her webcam to talk to everyone in the training session. When then answered/asked questions via chat through the keyboard. I start the webinars on the 14th! Thanks for the info. I start training the 14th as well Sarah. Good luck! Hi April, Thank you for all your comments. How on earth do you read over 1000 essays in a week? Thanks! This has been a great resource as I am considering applying to WriteScore. April, I hope you don’t mind but I did have a question for you in terms of the flexibility of the job. On the job posting it says applicants must be flexible “especially during the holidays.” Do you have any insight on why they need flexibility during the holidays? I am very flexible throughout most of the school year, but I do often travel over the Christmas holiday. Are you able to take time off or put in that you are unavailable at times? I was just curious as to why they specified they need flexibility over the holidays. Thanks for all the information found in this thread! So for the training seminars for stage two, are the times fixed as far as when you can do them? I’m trying to switch over to working online jobs, but until I get said jobs, I have to have a day job. If the training times are not flexible, I might have a problem, but I’d really like to have a shot at doing this. Thanks for the information, April. I saw that they’re hiring again so I’m going to apply. I read a bad review of Write Score on Glassdoor and was a little hesitant. Thanks so much! It definitely can be a lot of work and they are VERY strict on deadlines, but I totally understand why they need to be when they have people working from all over on their own schedules. I scorded for them for three seasons and never had any issues getting paid. The first season I worked for them they mailed physical checks and then later switched to direct deposit. I saw on Career builder that Write score was looking hiring a few people so I applyed about a week ago. I see it’s been a couple of years since the last post on here, but I was wondering if anyone who’s worked for them could comment. Were you notified that you were selected for training, or did they just start sending you material? Also, how long was there between applying and the training session? Hi Beth! I have been working with WriteScore for the last 2 years. I’m a little fuzzy on the time frame between when I applied and when I heard from them, but yes, they notify you first. If you respond that you are still interested, they send you Stage 1, which is a batch of 30 essays to score with instructions on how to score them. After passing that, they sent a schedule for Stage 2…the training seminars. I think I got that notice a month in advance…so I had plenty of time to clear my schedule for training. When I applied, I got in the last training seminar, and that was in September…so think they may start in late July, early August? The work fluctuates greatly…some weeks last year I was swamped with as many as 1000 essays and other weeks I received no work. Deadlines are also pretty tight (usually 2 to 3 days). I’ll admit it can be frustrating at times, but some of the essays can be very entertaining! Did you apply for this season? I applied and training starts next week. I am hoping to do well and be ready for the start of grade school in a few months. Have you gained anymore insight on the position? There is limited info out there other than reviews and blogs. I can’t wait until this one gets going again. I forget if I ever applied last year or not. I think I had applied to ETS and Pearson right around the same time, so I may have been overwhelmed with all of that. Just an update! I have been scoring for a little over a month now. It is great…but it is also time-consuming! Since I work from home as a freelancer, I have the time to devote to it, but it would be difficult for anybody with more than a couple of other “irons in the fire.” Even with working at home, I sometimes find it challenging to meet my scoring deadlines and keep up with my writing sites too! Speaking of scoring…I got a batch I need to be working on now! Thanks April! I wonder when/if they’ll be hiring again? I’m glad you got in and you like it! I would guess they won’t do anymore hiring until the summer (right before school starts). Things have been pretty slow lately. Hoping it picks back up soon! Just received my schedule for the training…looks to be a fairly long training process…2 to 3 weeks (a couple hours each day). So, like Anna said, this may turn some people off since you are training (unpaid) for a job you may or may not get. My training is not until next month, so that gives me plenty of time to free my schedule up for it. I may end up not getting the job, but I think it will be worth it if I do! I think this would be something I would really enjoy! Just an update…started training this week…looks like I could enjoy this! She said this was the last training group for the season. I suppose you might be able to send your ap, but I guess there will be no more training sessions until next season. Hope I pass the training! Good luck April! I hope you pass it, too. Sounds like this is a good opportunity! This looks -wonderful-. April, can you tell us how long it took you to get through stage 1? Since they’re essays up through high school level…I’m going to imagine they’re never more than a few pages long? Markato, the essays themselves are only a couple pages long. They send you 30. I didn’t really time myself, and I would assume it would get faster as you learn how to score them. I kept going back and rereading the ones they sent that had already been scored, so as to get somewhat of an idea. I’m still waiting to be placed in the webinar sessions of stage 2. I hope they haven’t sent something that I accidentaly deleted…I tend to do that if I don’t immediately recognize the sender. Good luck to anyone who applys!